Mary Breckinridge turned her personal tragedies into a lifelong journey to help others. Her work with the Frontier Nursing Service (FNS) that she established in 1925 is still enriching the lives of women and children today. Mary Carson Breckinridge, the second of four children, was born in 1881 to a wealthy southern family in Memphis, Tennessee. Her family was very influential in the government; her grandfather was the Vice-President of the United States under President Buchanan, and her father was a congressman and the U.S. Ambassador to Russia. Growing up, she traveled extensively, lived in many places and became familiar with various cultures and lifestyles. As a child, she lived on estates in Mississippi, Kentucky and New York and as a teenager, lived in Washington, D.C., Russia and Western Europe. The best private tutors in both the United States and Europe directed her education. She later attended boarding school in Switzerland and a finishing school in Stamford, Connecticut. Even though Mary was well educated, her mother discouraged her from going to college and encouraged her to take the more traditional path of marriage. Mary took her mother's advice and married a lawyer, Henry Morrison, in 1904. Their happy marriage ended only two years later when he died from complications of an appendicitis. After her husband's death, Mary decided to begin a career in nursing. She attended St. Luke's Hospital Training School in New York, graduating in 1910. Soon after that, she married again and bore two children, a son in 1914 and a daughter who lived only a few hours in 1916. As if her daughter's death were not enough grief, her son died two years later after a short illness. Following this tragedy, Mary divorced her husband, reclaimed her maiden name and started a life of caring for others. Her first nursing efforts were directed toward the care of victims of the 1918 influenza epidemic in the slums of Washington, D.C. The following year she joined the American Committee for Devastated France and organized a visiting nurse program in France. The program was so successful that two years later her nurses and midwives were caring for children and pregnant women throughout France. When Breckinridge returned to the United States in 1921, she found that there were no schools of midwifery and planned to start one. She studied public health nursing at Columbia University in New York and later took a public health survey in the Appalachian Mountains of Kentucky. She found that the women who delivered babies were mostly illiterate and none were trained in nursing. There were no physicians in an area that had one of the highest birth rates in the country but also the highest rate of infant mortality. Following her studies at Columbia University, Breckinridge returned to Europe to study midwifery at the British Hospital for Mothers and Babies in London. After she received her certificate, she went to Scotland for further training. She saw firsthand how the proper training of midwives reduced the death rate of both mothers and infants during childbirth. She vowed to bring this knowledge to America where the death rate of women in childbirth was among the highest in developed countries. Returning to Kentucky in 1925, Breckinridge established the Kentucky Committee for Mothers and Babies that was later named Frontier Nursing Service. Its headquarters was in Hyden, Kentucky, with a small medical dispensary. Originally funded by Breckinridge's personal funds, she hired six nurse-midwives who were trained in England and Scotland. Since there were no reliable roads in the mountains, the nurses relied on horses and mules for transportation and soon were called nurses on horseback. By the early 30s, these nurses serviced over one thousand rural families where they provided general health care, prenatal and postnatal nursing and delivered babies. As the program grew in stature, it received large donations that allowed it to build a small hospital, hire a medical director and establish a number of outpost centers. In the 40s when it became too expensive to send nurses to England to be trained, the Frontier School of Midwifery and Family Nursing was opened, the first of its kind in America. 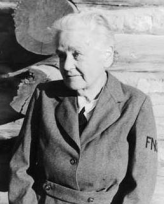 In 1931, Breckinridge had a serious fall from a horse that caused her to wear a brace for the rest of her life, but she continued to lead the Service well into her 80s. She died in 1965 at the age of 84 and is buried next to her children in Lexington, Kentucky. Mary Carson Breckinridge devoted her life to creating a legacy much larger than herself. Many lives in rural America were saved because of her dedication and vision. During her time with the Frontier Nursing Service, over 50,000 people were treated, over one quarter million vaccines were given and the rate of maternal and infant mortality decreased dramatically. She deserves to be included as one of the most famous nurses in history. Today, the Service continues with six healthcare clinics as well as Mary Breckinridge Hospital and Mary Breckinridge Home Health Agency. People come from all over the world to study this example of rural healthcare that Breckinridge founded. The Frontier School of Midwifery and Family Nursing is still in existence and offers excellent educational opportunities for nurses and nurse practitioners.